Whoo! I’m going to actually blog this one, kittens! And it will not be a sock today. Ahem. On needles is a gift for The Boy. He’ll be 4 on Sunday and I’m knitting like crazy every night to get this finished in time. He’s a rather observant little thing, so working on this while he’s awake is out of the question. 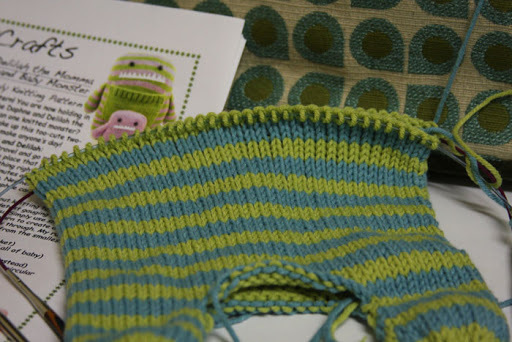 For months, he’s been bugging me to knit him a, “blue and green monster.” He picked out the pattern and yarn ages ago. He reminds me that I have not, in fact, knit his monster yet…oh, pretty much every day when he sees me working on something else. It becomes more then once daily when I’m working on toys for gift knits. Anyone who is not familiar with Danger Crafts and her patterns should check them out. There are a lot of monsters, but many other toys as well. In fact, this pug is next up on my list to go with the bunny rattle I blogged a little while back. So many of my favorite toy designers are getting book deals these days; I keep wondering if/when Danger Crafts will be offered one. It would be a must-buy for sure! Things are still crazy here as the number of days until the movers come gets smaller. We have 28 days–closer to 27 really, since Monday is almost over–and all of our things will be packed up, stuck on a truck, and we will not see them for about 3 weeks. As such, I’m pretty sure I can not stick to my usual WIP it Wednesday. Instead, I’m going to grab whatever chances I’m given to blog about my WIPs and, hopefully, an FO or two before my internet is cut on the 13th of June. First, I think I’ll blog Clue 2 of SKA’s May Mystery sock, courtesy of Cookie A. 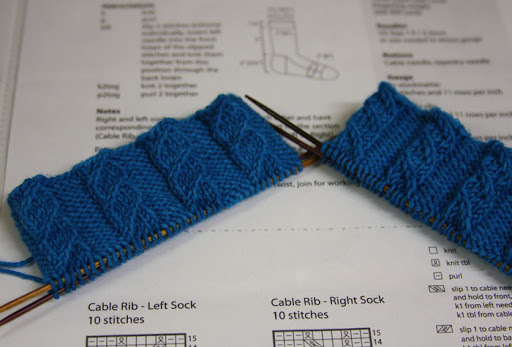 The pattern itself is pretty interesting–clue three is actually out but the second clue is taking longer then the first, so I’m still on the second sock. It has this spiraling bar thing going on. Clue 2 calls for three repeats on the leg, but thanks to my calf size, I could just eek out 2. Even that is a tight fit. I suspect to get three, I would have had to go up quite a few needles sizes and there’s no way the fabric would have been dense enough. As it is, these socks are taller then most of the others that I knit. I just like “short” socks. 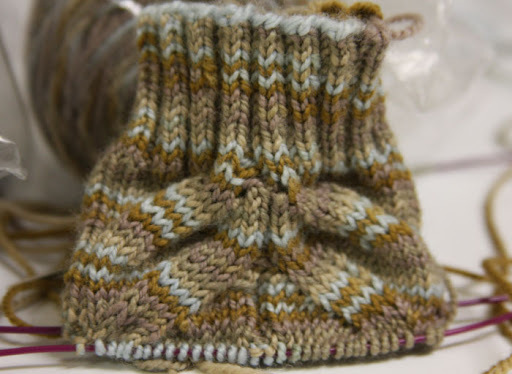 If I were to try this pattern or another like it in the future, I might try casting onto larger needles and as I work my way down the leg, decrease needle sizes to get a better fit. No WIP it Wednesday, kittens. I was so busy getting things set up for our move, that I forgot what day it was until I saw a fellow blogger post up her WIPs. Yes, I figured out it was Wednesday 100 minutes before Thursday starts. WIN. I’ll try to get a post out in the next couple of days. It would seem that my measures to bring back my mojo are thus far working. This week, there will be a WIP post. And there will be pictures! I’m still not moving very fast, but I am moving again. This week, I found inspiration in Sock Knitters Anonymous’ mystery sock, designed by none other then Cookie A! I’m a huge fan of her designs, so casting this on was a no-brainer and I even pulled out some Wollmeise for it. 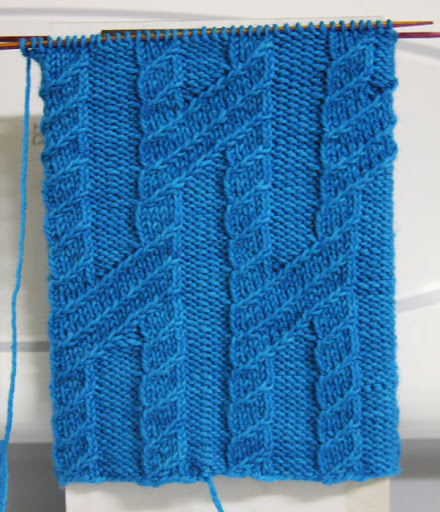 Cookie’s designs are often great for variegated yarn, but based on the cuff pattern, I thought something more solid was called for. The first clue was super quick and I’m hoping the next one will be the same. There’s just something about a quick project to perk up the spirits. I’m not participating in the actual contest for the KAL, so I’ll be able to alter and make the leg on these whatever size I desire. Since I cast on the large size, I may be able to get away with a slightly longer leg. Since I cast these onto a smaller needle size then I usually do, they’re a tad snug unblocked. I know that superwash wool will loosen a bit and I’m hoping it will be just enough. (After the move, I’m going to invest in some size 2s: 2.5s result in a sock that’s a bit too loose, 1.5s in a sock that’s just a touch tight.) Because of this, what is pictured is the actual leg height for this pair; any taller and they definitely will not fit. I’m not complaining: I like my socks on the short side. In a perfect world, I would have liked one more pattern repeat. And that’s it kittens! The theme for this week is socks. PRETTY socks. The first one was way too open and mesh like. I loved the size of him, but not the openness. I found a pattern for this little guy over at BearBuns Studio. The Husband has claimed the larger one and wants a WWI Flying Ace costume for it. There isn’t much else to say about the pattern. It’s pretty straight forward and even a crochet noob like me could figure it out. 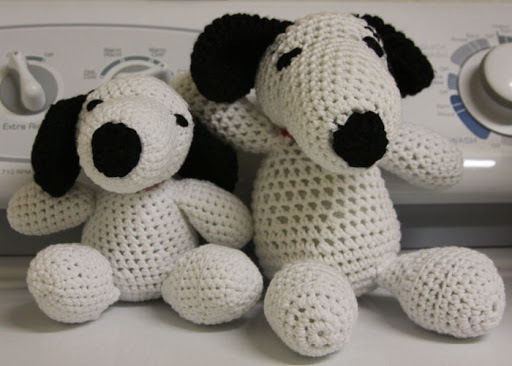 If I had more experience, I would have attempted to make the second Snoopy larger like the first. I’m very happy with how it turned out…so, all’s well that ends well.